INFORMATICS were a post-punk electronic band from Melbourne, Australia formed in 1981. Michael Trudgeon, Valek Sadovchikoff, Steve Adam and Ramesh Ayyar met in the experimental sound studio while attending the same art school. Philip McKellar later joined the band in 1983. 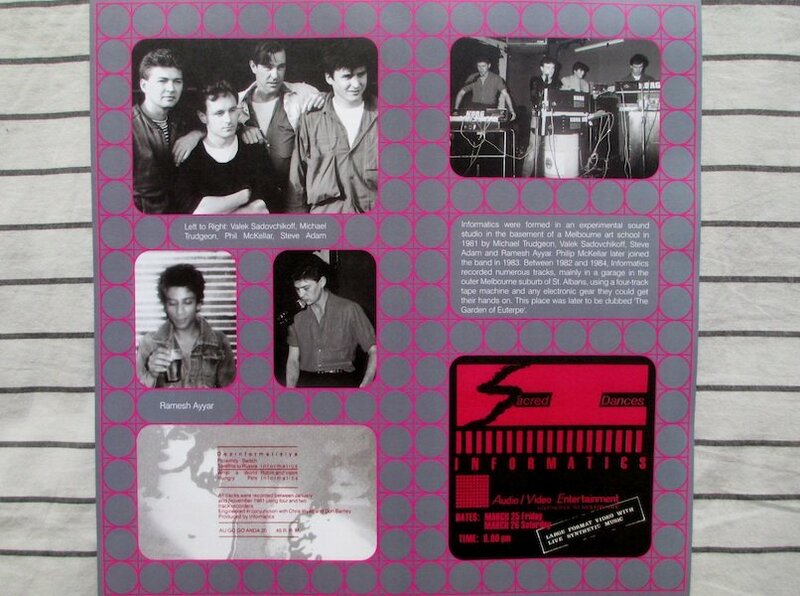 Between 1981 and 1985, INFORMATICS recorded numerous tracks, mainly in a garage, using a four-track tape machine and any electronic gear they could get their hands on. The band held a fascination for contemporary visual art and moving images and videos would accompany their live performances.The production elements in the videos reflected Informatics' philosophy on sound composition: the footage was entirely pirated from television ads, manipulated and then collaged to create new narratives that reinforced the music. 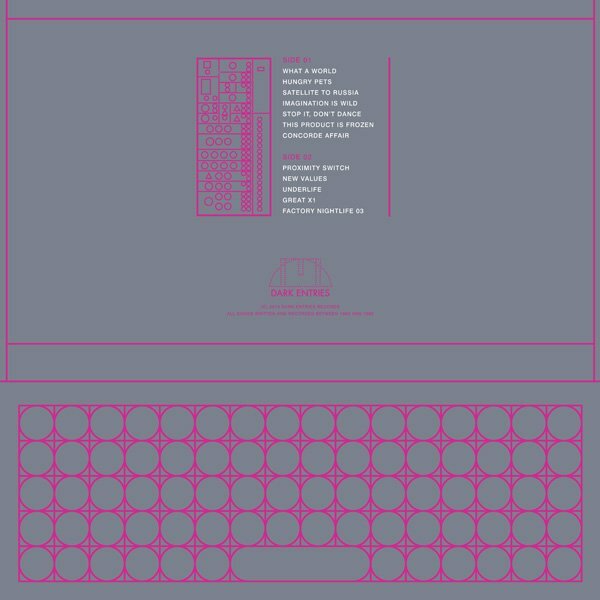 INFORMATICS came to work together through a shared fascination in electronic music and the capabilities of analogue synthesizers. In early performances, long before the advent of samplers, the Informatics used a collection of synthesizers and other analogue and hand built equipment. These were patched together to create a unique battery of sounds. 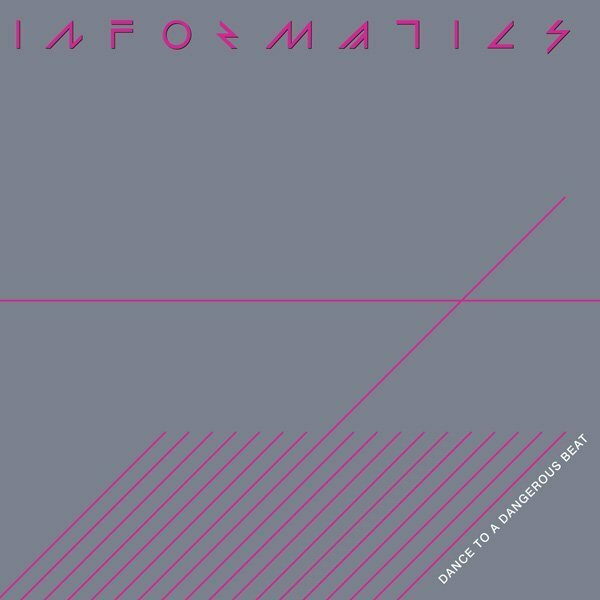 Between January and November 1981 INFORMATICS recorded their debut 4 song "Dezinformatzia" EP but it was not released until 1983 . 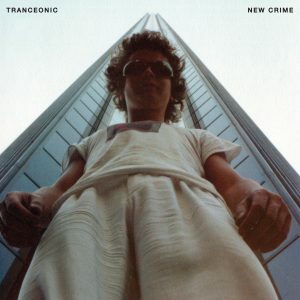 The track "Proximity Switch", later renamed "Accidents in Paradise" became popular in parts of Europe and was re-released in 1985. "Dance To A Dangerous Beat" collects all 4 songs from the first EP, 2 songs from compilation appearances as well as 6 unreleased tracks on vinyl for the first time. Informatics early songs have a brittle, cold, disconnected feel made by a Roland SH-101, Korg MS-20 and a lot of processed guitar. 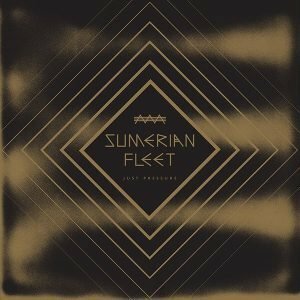 The later songs utilize newer technology and ambient, synthesized melodies closer to their country mates Severed Heads. All songs have been transferred from the master tapes by INFORMATICS and remastered for vinyl by George Horn at Fantasy Studios in Berkeley. The vinyl comes housed in a full color printed jacket using the original magenta and grey artwork from "Dezinformatzia" EP. 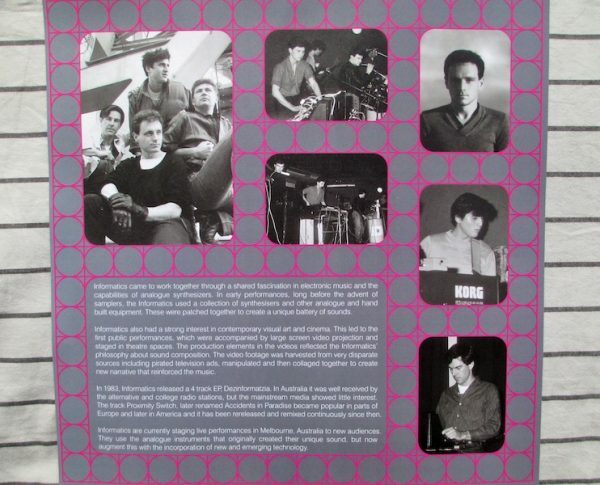 Each LP includes a double sized 11x11 insert with photographs and liner notes by the band. "Dance To A Dangerous Beat" recounts the history of these synthpunk pioneers a world away from their contemporaries in America.